My pet is a dog. 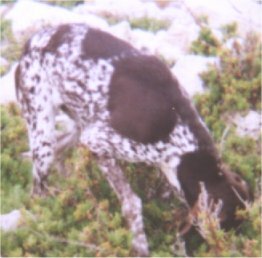 Its breed is German Shorthaired Pointer. Its name is Sonique. It likes to eat our food and drinks milk and water. It likes swimming even in winter. These dogs are familiar with people. At 3 months of age it needs to be given 3 boosters and some vitamins. A year after it needs to be given another booster. This booster contains a medicine which will protect your dog from the �White Fly�. Meals should be given at regular times. When your dog is under 6 months of age, it needs 2 to 3 meals daily. Cereals, bones, meat, dry food, clear soup, cooked vegetables and eggs are all examples of food that can keep your dog healthy. Don�t give food to your dog before sleeping time and keep its weight under control. A popular method to teach your dog manners is to spread newspapers around its bed. Train the puppy by putting it regularly on the newspapers or whenever you see it sniffing around. When the puppy wets the newspaper praise and pet him. It will soon learn what it�s expected of him. At 8 months the important commands �come�, �sit� and �heel� can be taught. The puppy tries to learn and is anxious to please, but tires out easily. By firm and gentle methods, with lots of praise and rewards, the dog will learn to obey all the commands. Never punish the dog when he disobeys a command while training. 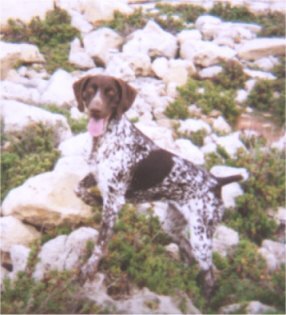 The German Shorthaired Pointers are sporting dogs because they point for birds. In this photo the dog is fetching birds. These dogs like to point for quail best and are always on alert when they hear gun shots especially those of their masters.